In March 2015, Elliot won 1st prize this weekend in the Hilton Head International Piano Competition! Elliot appeared on Show 301, recorded in San Francisco, CA, on February 14, 2015. Elliot Wuu (piano), 15, is from Fremont, California, and attends Valley Christian High School Conservatory of the Arts in San Jose, California. He is a student of Yoshikazu Nagai at the San Francisco Conservatory Preparatory Division. He won the First Prize and Klavierhaus award for best performance of a Romantic piece in the Kaufman International Youth Piano Competition, Second Prize and special award for the most outstanding performance of a composition by a Russian Composer in the 7th Bösendorfer and Yamaha USASU International Piano Competition, First Prize in Young Musician Category and Second Prize in Junior Category of the San Jose International Piano Competition, and First Prize of the ENKOR Piano and Violin International Competition. 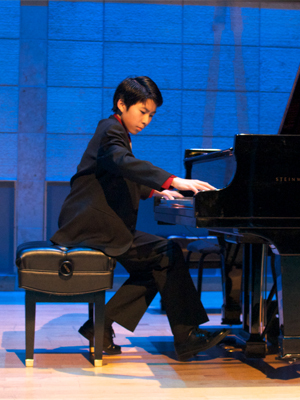 Since 2014, Elliot is named a young scholar of Lang Lang International Music Foundation with the mission of inspiring and educating the next generation of classical music lovers and performers. Aside from music, Elliot enjoys golf, billiards and swimming. He is also a big fan of Peanuts Comics and especially loves Schroeder.